The Climate-Shield® Rain Screen System™ is constantly on the move, creating new and innovative rain screen components and accessories that will improve the performance of, and protect, your investment. 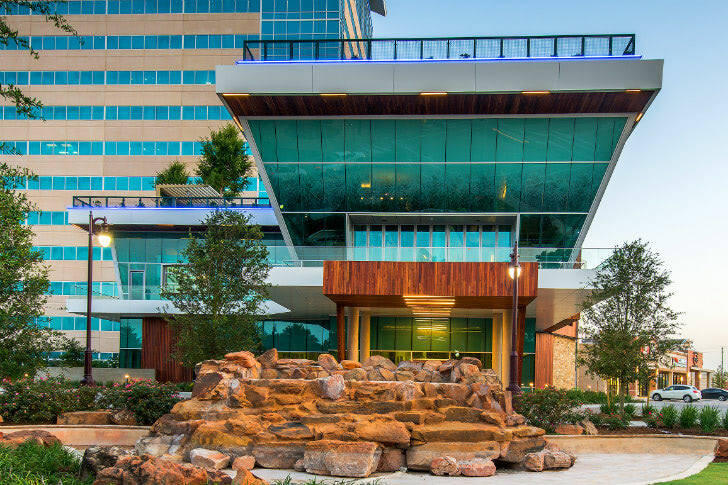 We believe that our commitment to continuous improvement is why we can offer you the most complete and innovative rain screen wood siding system available. Once you decide to invest in a Rain Screen siding system, you should then discover what accessories and other components that you will to need to consider for your project. We have compiled many of the key accessories and components on this page to ensure that your rain screen system not only looks great, but works efficiently, and lasts for a very long time. 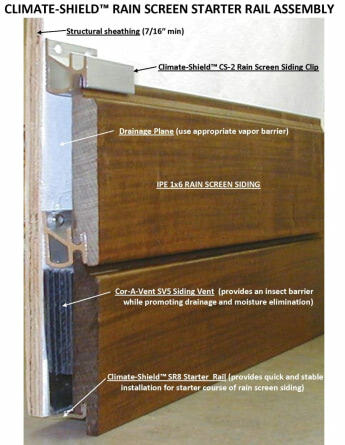 The Climate-Shield CS2 Rain Screen Clip is the heart of this rain screen wood siding system. It provides a uniform 3/4" wall cavity between the drainage plane of the building envelope and the rain screen wood siding. 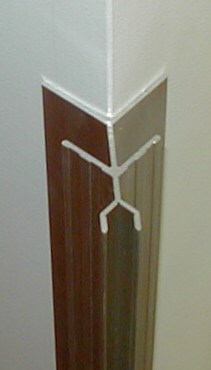 Like all Climate-Shield aluminum rain screen components, the rain screen clip is made in the USA. Two stainless steel screws are provided with each marine grade aluminum alloy rain screen clip. This ensures a quick and secure fastening to the exterior sheathing, that will stand the test of time and the forces of nature. *In the photo above, the Climate-Shield CS2 Rain Screen Clip is shown securely fastened with two stainless steel screws to the building envelope. The rain screen clip can be used to "straddle" or "bridge" the ends of two pieces of rain screen siding to speed installation time. 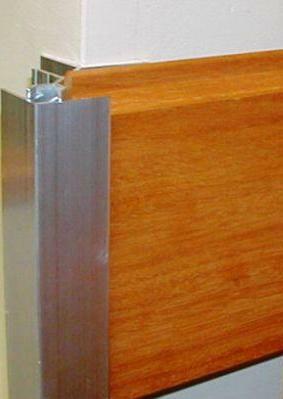 Since the unique design of this rain screen clip eliminates the need for furring strips, it is not necessary to cut the ends of siding boards to accommodate 16" O.C. studs. Simply add rain screen clips at the end of the siding board and let the rain screen clip "bridge" to the next piece of rain screen siding. This saves money by allowing less siding material waste and speeds up the installation time and reduces labor costs. The Climate-Shield CS2 Rain Screen Clip is an amazing fastener for exterior walls that use structural panels such as plywood or OSB sheathing. When plywood or OSB exterior sheathing is used, the Climate-Shield CS2 rain screen system is designed to withstand hurricane winds in excess of 200 MPH. The Climate-Shield 8' Rain Screen Horizontal Starter Rail CSSRHS8 will speed up your installation process and provides an easier method to make sure your first course of siding is perfectly level. The CSSRHS8 leaves a 3/4" wall cavity (rain screen gap) behind the siding and is compatible with the CS2 rain screen clip. This innovative rain screen siding accessory item is angled back at the bottom to allow any moisture or water in the wall cavity between the rain screen siding and the drainage plane to flow toward the weep holes for rapid removal of any water. 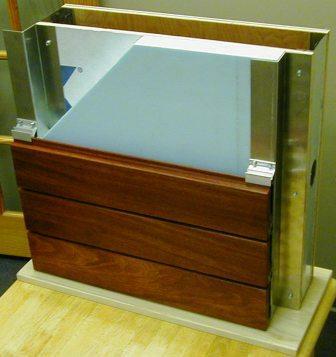 The CSSRHS8 rain screen starter rail is highly effective for horizontal wood rain screen siding installations. 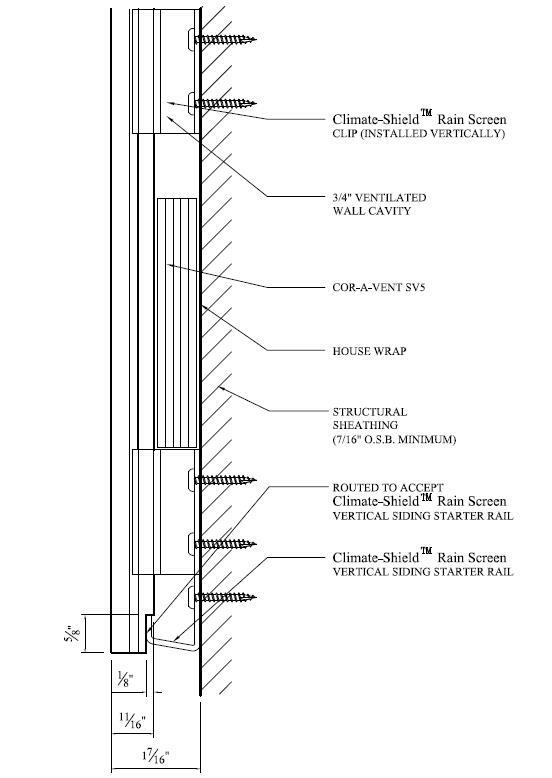 The Climate-Shield 8' Rain Screen Vertical Starter Rail CSSRVS8 will speed up your installation process and provides an easier method to make sure your first course of siding is perfectly level. The CSSRVS8 leaves a 3/4" wall cavity (rain screen gap) behind the siding and is compatible with the CS2 rain screen clip. This innovative rain screen siding accessory item is angled back at the bottom to allow any moisture or water in the wall cavity between the rain screen siding and the drainage plane to flow toward the weep holes for rapid removal of any water. 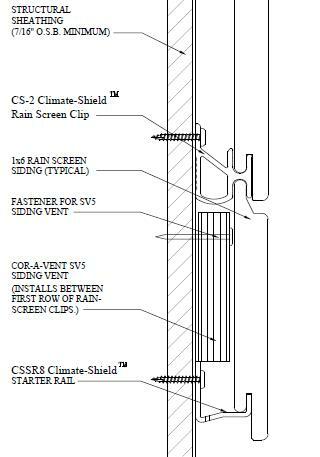 The CSSRVS8 rain screen starter rail is effective for vertical and diagonal installations of rain screen wood siding installation. We have found the Cor-A-Vent SV5 siding vent provides an excellent insect barrier and an effective ventilation for the rain screen wall cavity between the rain screen siding and the drainage plane material of the building envelope. The four foot length of the material makes it easy to handle and install. Because it provides 3/4" spacing, this siding vent is ideal for installations with Climate-Shield CS2 rain screen components. The Cor-A-Vent SV5 rain screen siding vent is applied at the starter course of siding and also at the top course of siding below the soffit. On gable walls the siding vent can be installed at the top course of rain screen siding just below the rake or gable trim. The rain screen siding vent may also be installed above door openings and above and below window openings to allow proper drainage, ventilation and as a barrier screen for insects. At the interface of the rain screen siding to the door and window casing, it is often desirable to have a transition trim strip for a more finished appearance. This can be accomplished by building transition trim strips in the shop or in the field. In the photo at the right you will see a piece of 3/4" marine grade plywood ripped into a 2-1/2" wide strip. Then you can rip a piece of board stock to match your rain screen siding. Then you pre-drill the back of the plywood through the finish trim board (here we have selected Ipe boards to match the Ipe rain screen siding) and screw it together. These door and window trim transition strips can be built on site or we can fabricate them for you in climate controlled conditions in our shop. You are free to select any species of wood to match your rain screen wood siding including Ipe, Cumaru, Garapa or FSC Machiche. Once this door and window trim transition component is built, you can trim it to length on site and install it over your building envelope abutting your weather-tight window and door openings. Since the 3/4" marine plywood is covered by the rain screen wood siding, this step must be performed prior to installing your rain screen wood siding. 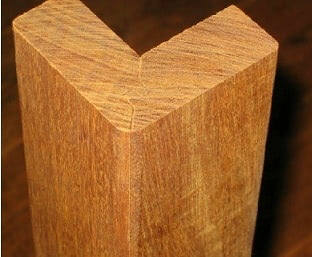 Wood Outside Corners are available in both vertical and horizontal options. 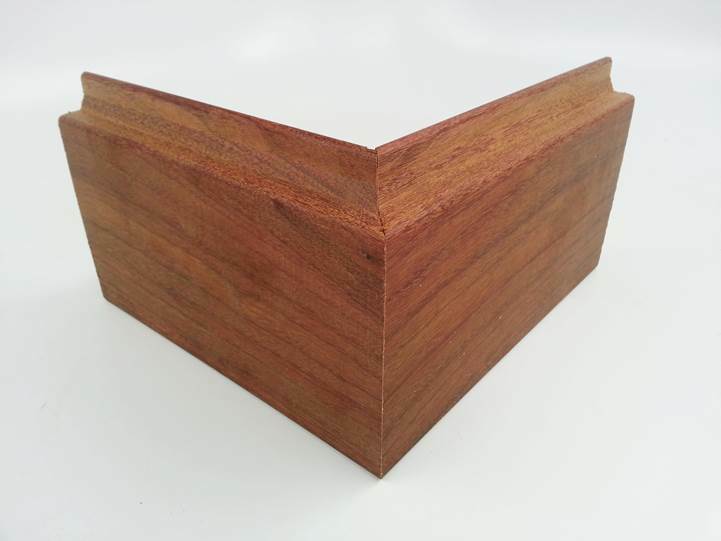 Wood Outside Corners for the Climate-Shield System can also be custom made out of the same material as you are using for your rain screen siding. Choose your favorite wood siding species. 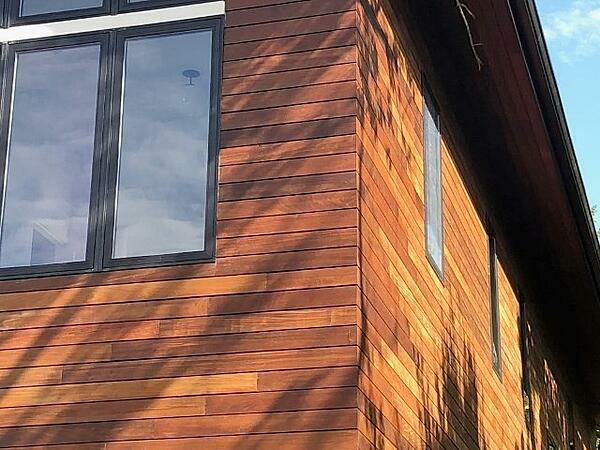 Vertical wood outside corners provide the traditional look with horizontal siding. Download the Vertical Wood Outside Corners Brochure. For a more contemporary look, many architects and designers prefer horizontal wood outside corners. Download Horizontal Wood Outside Corners Brochure. We have developed a beautiful and long-lasting solution for this design. The Climate-Shield rain screen aluminum outside corner system consists of two components: an outside corner base piece and an outside corner finish piece. The rain screen outside corner base is installed with stainless steel screws (provided) over the building envelope prior to installing your rain screen siding or rain screen starter rail. The Climate-Shield rain screen aluminum outside corner base piece (shown at left) attaches with stainless steel screws to the outside corner of your building envelope before you start installing your rain screen siding. The rain screen aluminum outside corner finish piece attaches easily with a rubber mallet for a crisp finished appearance to your rain screen siding project. The Climate-Shield Rain Screen Aluminum Outside corner may also be finished with a full palette of powder coat finish options to enhance, match or complement your color scheme. A broad range of colors from Cardinal are available in a powder coat finish for the Climate-Shield Aluminum Outside Corner. Click to download chart (below). What If I am NOT Installing over plywood or OSB sheathing? Climate-Shield has developed a component to create a rain screen system that can withstand hurricane wind punishment when non-structural exterior sheathing is used. The Climate-Shield CSAC8 Attachment Channel is a heavy duty rain screen component, specifically designed for use with non-structural sheathing. It works similar to a hat channel, except it's a lot easier to install and secures more effectively. Like other Climate-Shield components, the CSAC8 Rain Screen Attachment Channel is made from rugged marine grade aluminum for extended life, additional strength and affordability. After the Rain Screen Attachment Channel is securely fastened to the substrate, the Climate-Shield CS2 Rain Screen Clip can be fastened to the rain screen channel using the stainless steel self-drilling screws designed for the Climate-Shield rain screen system. With rising energy costs and sustainable design taking center stage, exterior insulation is frequently used. More efficient building designs, reduced operational costs and improved life cycles are driving this growing trend. Z-Girts are an excellent way to provide secure attachment to the building without affecting exterior insulation. If you are designing or building with exterior insulation, the Climate-Shield CSZG8 Z-Girt is an excellent attachment to consider. It's strength and rugged marine grade aluminum composition are totally compatible with other Climate-Shield component. Climate-Shield CS2 rain screen clips fasten securely to the CSZG8 Z-Girts with self tapping stainless steel screws.